I’ve never eaten at the famed Magnolia Grill in Durham, North Carolina. I heard of it only through recipes that had popped up in food magazines here and there. That’s where I got the recipe, years ago, for Balsamic Bacon Vinaigrette. 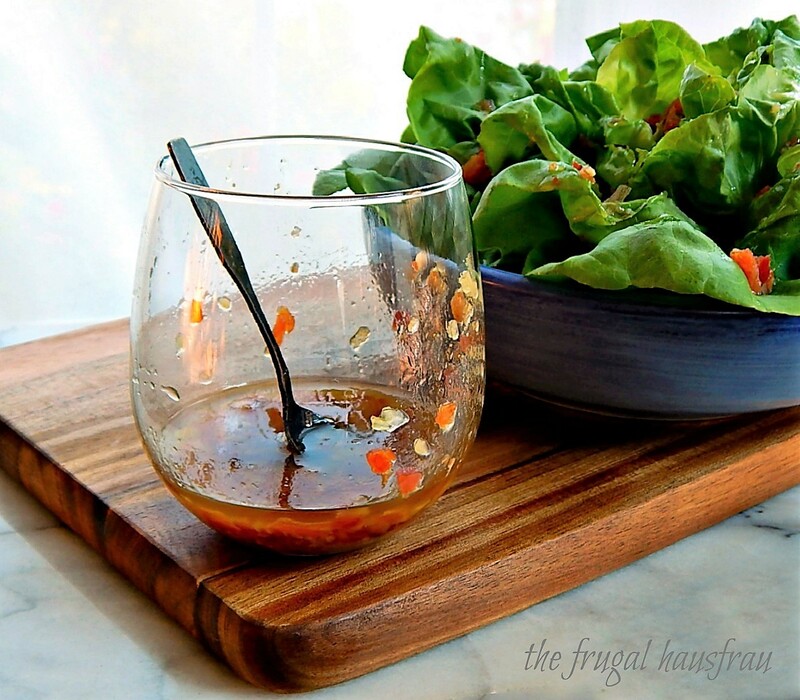 I loved the idea of a warm bacon dressing; I think I was predisposed to love this Balsamic Bacon Vinaigrette because I’d had my Grandma Irene’s Warm Bacon Dressing (she called it Wilted Salad) when I was a child. I remember never having tasted anything so wonderful (well other than chocolate) but my always dieting mother (I could have learned a lesson from her…) refused to make it. ever. again. This dressing is a little more sophisticated than those old German recipes (but I should post Grandma’s sometime, now that I’m thinking of it) but is so simple to make. And while Magnolia Grill used an aged Balsamic, I love using a White Balsamic. It just marries so well with the garlic and the little touch of brown sugar. Magnolia Grill’s Balsamic Bacon Vinaigrette, served over a simple Boston lettuce head with some Bleu Cheese. Honestly, it’s like candy for your salad and who wouldn’t want to eat that? I’m usually one to load up salads (here’s my Salad Menu) with all kinds of healthy veg, fruits, beans, nuts, etc. and Balsamic Bacon Vinaigrette is very good over a classic Spinach Salad. You know the one, the salad with eggs, sunflower seeds and dried cranberries? Today, I let this dressing shine on it’s own. A simple lettuce, a little cheese (I used Bleu Cheese, but Feta comes to mind immediately) just to offset the bacon and you can call it a day. Serve your head of lettuce in a bowl, dressed to impress with a little of the dressing, then cut it into wedges at the table and pass the remaining dressing. No matter how you serve Balsamic Bacon Vinaigrette, you might very well want to double this recipe. And if you want to make it very easy on yourself, when you cook up bacon for breakfast or your BLT, make a little extra for this dressing and set it aside with a tablespoon or so of the drippings. Cook bacon until crisp, remove, chop and reserve. Empty all but a tablespoon of the drippings from the pan. Add the oil and warm through. Add in the shallot (or onion) and garlic and let cook gently for a minute or two. Remove from heat, whisk in the vinegar and brown sugar. Add bacon back to dressing. Taste (when cool enough) and season with salt and pepper as desired. Serve warm. This is enough to dress a good sized salad, say 6 to 8 servings. This entry was posted in Click here for Fabulous Food Posts and tagged Bacon, Balsamic Vinegar, Frugal Hausfrau, magnolia grill, Salad, Salad Dressings. Bookmark the permalink. Did somebody say BACON?? Great recipe! hahaha!! Yep, bacon. It was all I could do not to just drink the stuff, lol!! You won’t go wrong with this! I love both variations! 🙂 Probably because I like changing things up all the time. Thanks! It was very good on a hot day!! 🙂 Just the thing. I could have never dreamed up this incredible concoction. It sound heavenly!! Thanks, Colleen! I tend to get on kicks, and am already resisting the urge to make this again. and again. and again, lol! Gotta love when you find something worth making and eating over and over again! Anything with bacon in it has to be good! I hear you, but I have to agree with Liz. Anything combined with bacon and then even lettuce becomes attractive. She was a great cook and a lot of fun, but she’d go through these phases, lol!